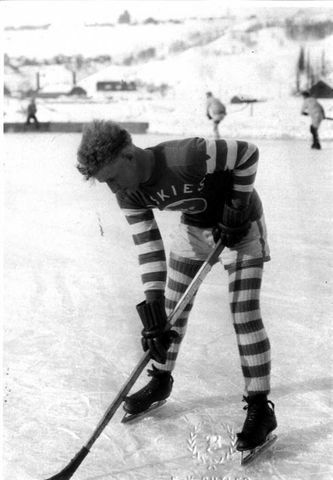 Frank W. "Nick" Kahler (1891-1983) born in nearby Dollar Bay, played amateur hockey here in the Copper Country. 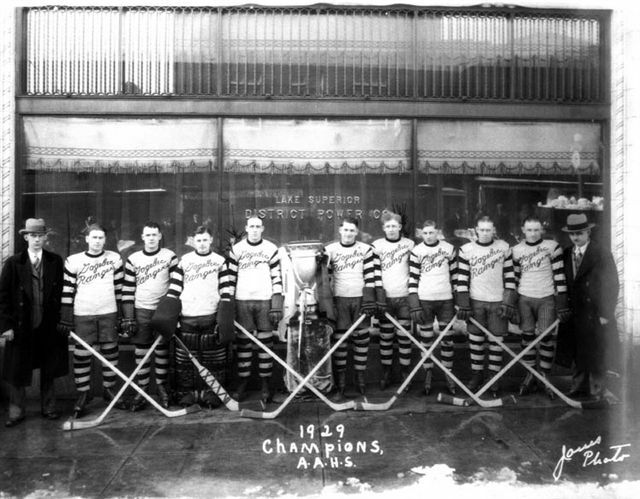 He moved on to play hockey with the Duluth Curling Club 1913-1914, then formed the St. Paul Athletic Club 1914-1920. 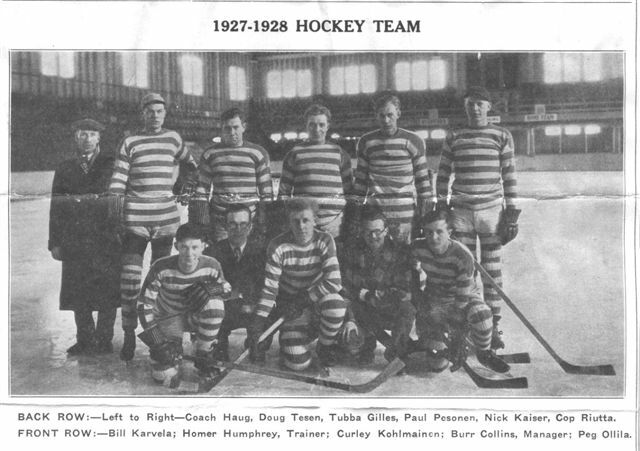 He was player/coach of the 1914-15 St. Paul Athletic Club when they entered the Western Division of the American Amateur Hockey Association, the highest level of hockey in the states at that time. The following year, he lead his team as Captain to the Championship of the League bringing home the famous MacNaughton Cup. 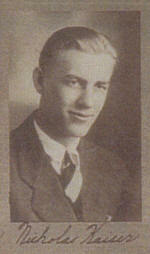 From 1920-1927 & 1936-1937 he played for the Minneapolis Millers, and for Augsburg College 1927-1928. He was selected for the 1920 Olympic Team, but for financial reasons, he did not play; he was also selected to coach the Augsburg College Team to represent the United States in the 1928 Olympics, but a decision was made not to send a team that year. In addition to hockey, in Minneapolis he founded Golden Gloves boxing; he was inducted into the Minnesota Sports Hall of Fame in 1962. He was inducted into the U.S. Hockey Hall of Fame (Administrators Division) in 1980. Photo Courtesy of Robert Kokko. Standing L-R: unk, Alex Wellington, unk, Ed Fitzgerald, Hugh Gawley -Coach, Tony Conroy. Kneeling L-R: Nick Kahler -Captain, unk. Photo courtesy of Kolehmainen family. Eric Kattelus, born 1987 in Traverse City, Michigan, and played with the local Midget AAA team, the Ojibwa Eagles for 2 seasons 2003-04; he graduated from Houghton High School. He played for the Bismark Bobcats in 2005-06 in the NAHL where he scored 35 goals, 40 A in 50 games and was named the NAHL Rookie of the Year. He played the 2006-07 season with the Indiana Ice in the USHL where he scored 18 goals, 21 A in 50 games, helping them advance to the semi final games of the USHL Clark Cup playoffs. 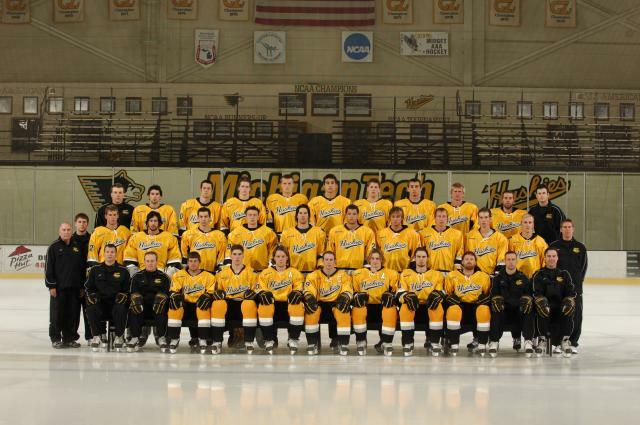 He went on to play D1 hockey with Michigan Tech from 2007 to present; where he lead the Michigan Tech Freshman with 10 points his first year. 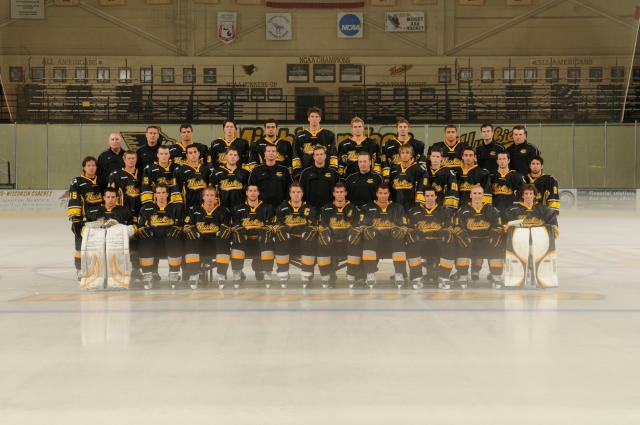 Front Row (L to R): Assistant Coach Chris Tok, Assistant Coach Pat Mikesch, Peter Rouleau, Jordan Foote, John Schwarz, Jimmy Kerr, Tyler Shelast, Mark Malekoff, Jake Wilkens, Head Coach Jamie Russell, Volunteer Assistant Coach Randy McKay; Middle Row: Trainer Chris Ipson, Student Manager Shawn Doll, Rob Nolan, Geoff Kinrade, Alex Gagne, Michael-Lee Teslak, Malcolm Gwilliam, Justin St. Louis, Mike VanWagner, Derek Kitti, Alex Lord, Ryan Angelow, Strength and Conditioning Coach Kyle Bangen; Back Row: Student Manager Corey Rastello, Jordan Baker, Eli Vlaisavljevich, Deron Cousens, Eric Kattelus, Ryan Bunger, Bennett Royer, Drew Dobson, John Kivisto, Kevin Hachey, Video Coordinator Jonathan Hamilton. Robert Kitti, (19-- to 19--) born in --, grew up playing hockey in the Calumet area. 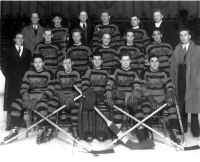 He was on the 1931 Tamarack Falcons when they won the U.P. Championship and were winners of the Hawks Trophy. 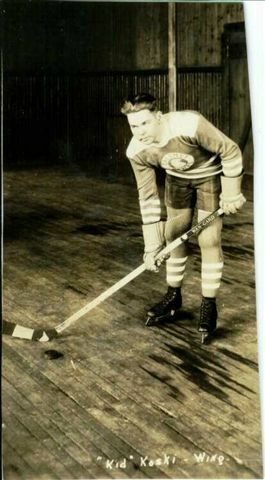 He later played pro hockey with the Detroit Pontiac McLeans in 1938-39. Ernest R. Klingbeil, (1908-1995) born in Hancock, played defense for the University of Michigan 1932-33 season, then Ike played with Detroit teams in the Michigan-Ontario HL for 3 seasons before being picked up by the Chicago Black Hawks (1936-37) for 5 games, getting a goal and an assist. 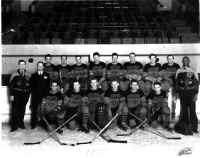 The 1936-37 season was when the Chicago Black Hawks owner, Major Frederick McLaughlin, decided he was going to play with an All-American team, made up of players only born in the US. He also said he planned to name his team the "Yankees" for the following season. Other teams in the league protested saying that drawing a game against the All-American team would "be an easy win" and make the game standings unfair. The following season, the 5 All-Americans were cut from the team. Klingbeil then played with the Portage Lake team in the NMHL. Ike was recognized as an iron-man hockey player, often playing entire games. 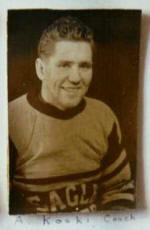 He was Captain of the Portage Lake team in 1938-39 when they won the NMWHL Championship and the Gibson Cup. 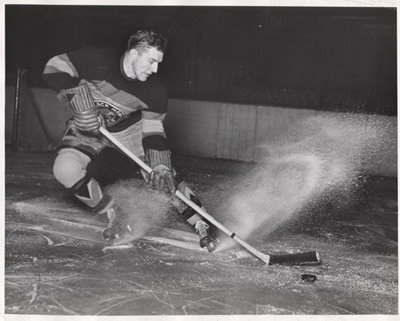 He served in WWII and when he returned, once again played hockey: he was Captain of the Portage Lake team in 1947-48 when they were the MOWHL Champions and won the Gibson Cup. In 1940, he was named to the NMHL Second All Star Team. He was inducted into the UP Sports Hall of Fame in 1995. 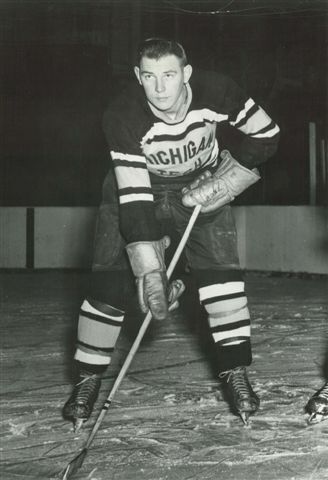 George Koivuniemi, born 19-- in CLK?, played with the 1937-38 Calumet Olympics when they won the MacNaughton Cup and won the Michigan State A.A.U. Championship. In 1938-39, he played with the Calumet Laurium Chevrolets. 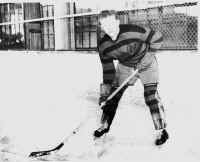 He went on to play pro hockey with the EAHL Baltimore Orioles hockey team in 1940-41 and the AHL Washington Lions in 1941-42. Raymond Kolehmainen or "Red" or "Cotton" aka Kohlehinen, Kohlman, Kolman, Coleman, (1903-1975) was born in Hancock, Michigan and lived in nearby Ripley, a small town on Portage Lake. He was called by a number of nick names in place of his long family name. 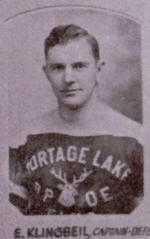 Curly played hockey with the Portage Lake teams 1924-1928 and also for the MTU Huskies 1927-28. 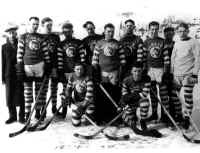 He was playing on the 1927-28 Portage Lake Cubs hockey team when they won the U.P Championship. 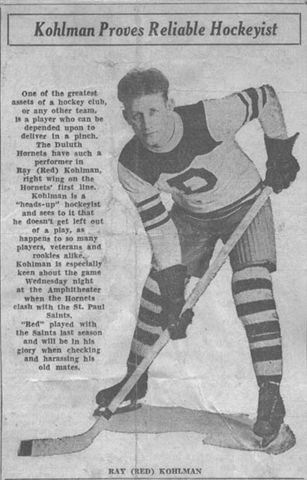 After that he played for the Gogebic Rangers -Ironwood when they were the 1929 Champions of the AAHS. 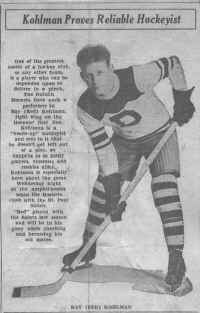 The next year, he played with the Hancock HC -when they were the 1930 AHA Champions winning the MacNaughton Cup. 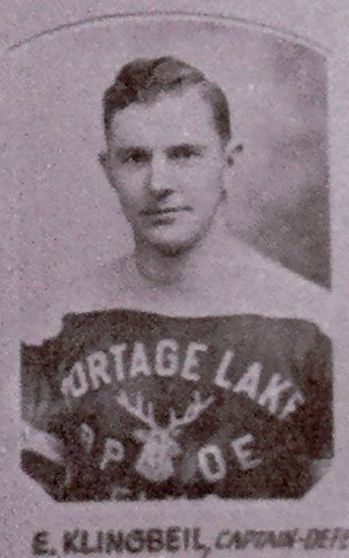 1938-39 Portage Lake Elks the NMW winner of the Gibson Cup; and was playing for the Portage Lake team in 1948 when they won the League Championship and the Gibson Cup, so his hockey career spanned many years! 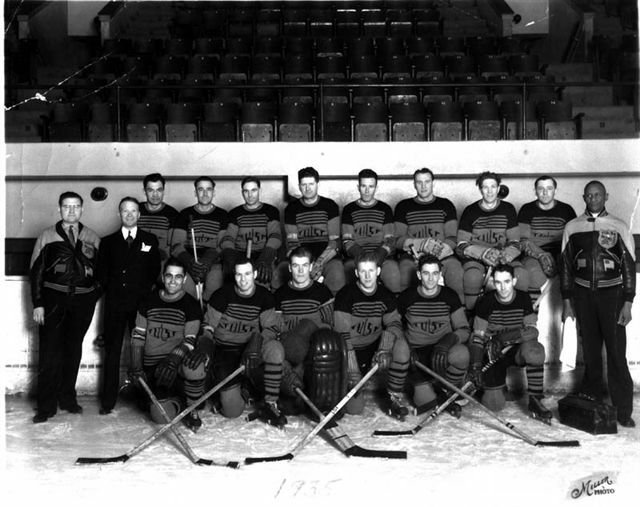 Top Row L-R: MCM Coach Carlos Haug, Douglas Tesen, Ted Nelson, Curly Kolehmainen, Jack Crawford, Paul Pesonen, Hank Latva, Bill Mason, Edward Gillis, Albin Sippola. Kneeling L-R: Peg Ollila, Leo Roy. 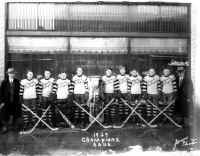 L-R: Doc Conn, Sam Kokko, Doc Allaire, Buster -- -Goalie, unk, -- McGregor, Curley Kolehmainen, Syd Polhill, Mickey McMasters, Neil Hogg, -- Trethwey -mgr. Curly is top row, 3rd from left. Curly is top row, 3rd from Rt. Curly is kneeling, 3rd from Rt. Arthur Koski, born 1909 in Calumet, brother to Wayne and Wesley, played right wing. After leaving Calumet, he played semipro for Duluth Hornets and St Paul. 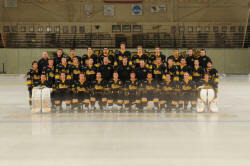 Photo courtesy of Lois Kallunki. 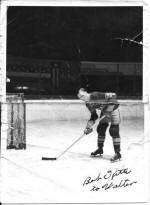 Wayne Edward Koski, (1903-1968) was born in Calumet, brother to Art and Wesley, played hockey on the Calumet teams then he played professional hockey from 1928 through 1934. Waino played with the Marquette Indians and the Calumet Hawks, where he played center. 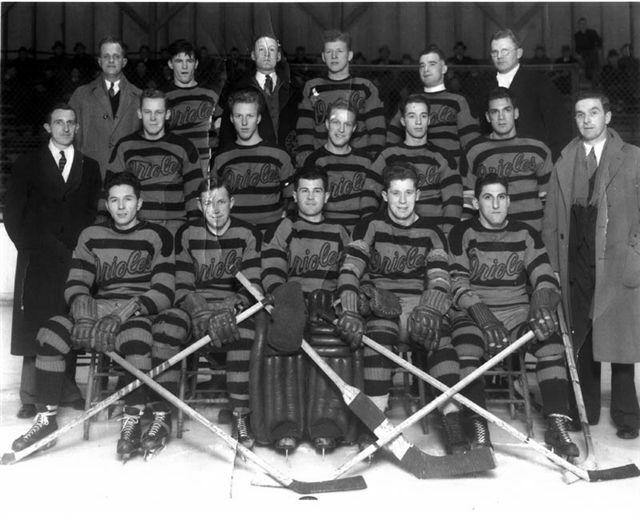 He then played for the Duluth Hornets (AHA) in 1928-29 and 1933-34, for the Boston Cubs (CAHL) (the Bruin's farm team) in 1931-32 and for the Regina Capitals/Vancouver (WCHL) in 1932-33 and then with Edmonton, which he left in 1934. When working in the Detroit area, he played with the Pontiac and Windsor Motors teams. Wesley Koski, born 1905 in Calumet, brother to Wayne and Art, played right wing, he played high school hockey in Calumet under coach Hiram Roehm and later played junior hockey with the Calumet Colosseum team with "Farmer" Cane as manager. He then played for the Calumet Hawks several years; where, he scored the first and last goal in one season. They won the MacNaughton Cup while he was on the team. 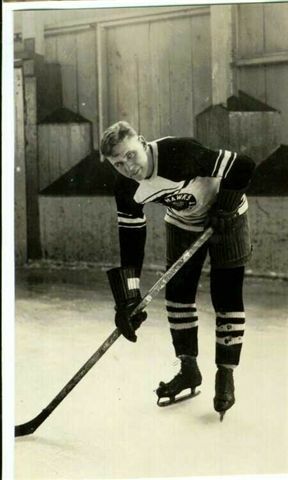 After playing pro hockey in Calumet, he returned to the amateur hockey ranks and played in Detroit with the Holzbaugh V-8s, a team whose roster carried mostly former Copper Country players. He broke his ankle in a game in Canada in 1934 and did not play again. 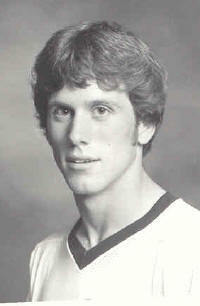 Frank Krieber, born 1959 in Hancock, was the goaltender for Houghton High School 1973-1977 and on the All Conference Team and Most Valuable Player Award in 1977. 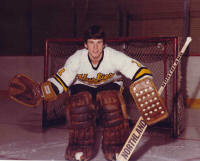 He went on to be Michigan Tech's Goaltender 1977-1981. Honors Frank received as an athlete at MTU: 1980 -WCHA Honorable Mention Team; 1981 - WCHA First Team; 1981 Merv Young Award for the Most Valuable Player; 1981-Goaltender in the NCAA Final Four when MTU finished 3rd place. Ken Kulju, born 1932 in Hancock, lived in nearby Coburntown on Quincy Hill, played defense for Michigan Tech 1951-54 hockey under coaches Amo Bessone and Al Renfrew. He was a Hancock High School grad where he played football and played hockey with local teams; in 1952 and '53 he played baseball for the Hancock Merchants. He graduated from MTU in 1954 with a degree in Metallurgical Engineering then worked shortly for General Motors until he was called to active duty by the Army in September 1954. He served as a Lieutenant with the Ordnance Corp at Aberdeen Proving Ground in Maryland and Frankford Arsenal in Philadelphia, Pa. After his service was completed in 1956, he continued his Engineering career and retired in 1993 as Vice President of Product Engineering and Quality from SPS Technologies in Jenkintown, Pa. Ken and his wife currently reside in Warminster Pa.